Garden hose reel is used to store garden hoses. They are made of metal or plastic and are shaped like wheel. They come with a crank to roll the wheel and stow away the garden hose. They are the best way of storing garden hoses without causing any damage to the hose. In fact they are the safest way of storing garden hoses and increase their life due to proper storage. Garden hose reels protect the garden hose from getting damaged by being in the sunlight for too long. Freestanding Hose Reel: If you have larger yard or need a garden hose reel for commercial use, then a freestanding model may be the best choice. 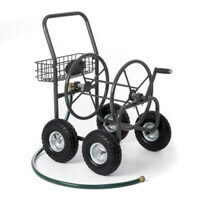 In model the hose reel is mounted wheels and it can be easily moved around large spaces. This is the best way to keep the garden hose untangled during use. Easily store the freestanding hose reels in your utility shed. Wall Mounted Hose Reel: These are the best solution for small spaces. They are easily to install as they mounted right on the wall. They take very less space and can be mounted near the faucet. Manual Hand Crank: These types of hose reels have a manual crank bar to roll the garden hose by hand. They are best used for smaller hoses. Piston Driven: These have spring load system in them and automatically pull in the garden hose by turning in a circular motion. These are best if the length of the garden hose is very long or it you do not like to manual turn the crank wheel to stow away the hose. Designs: Hose reels are also available in fancier designs for those who are concerned about the aesthetics of their yard. Garden hose reel can be used to store garden hoses in private or commercial spaces. Garden hose is often used with pressure pump for cleaning outside areas like grime around the fences of a house. The pressure pump needs a water inlet and the garden hose serves as that water inlet. This makes it easier to use the pressure pumps even at distances from the faucet. Commercial or personal use: The first thing to consider is whether the hose reel is for commercial use or personal use. Both are categorized separately at a hardware store. Size of the yard: Small yards would require a wall mounted hose reel as the space for storing a freestanding reel would be less. Size of the garden hose: The size of the garden hose reel is chosen depending upon the length of the garden hose. Every reel has a different storage capacity. There is no point in a buying a smaller hose reel for a longer garden hose, it won't fit in. Storage space: Wall mounted hose reels require very less storage space, freestanding hose reels on the other hand required more storage space. Choose the best high pressure hose reel for your needs. Get rid of debris and hard to clean matter in no time!